BAY COUNTY, Fla. - If you are looking for a part time job with flexible hours after Hurricane Michael there's an option for you. 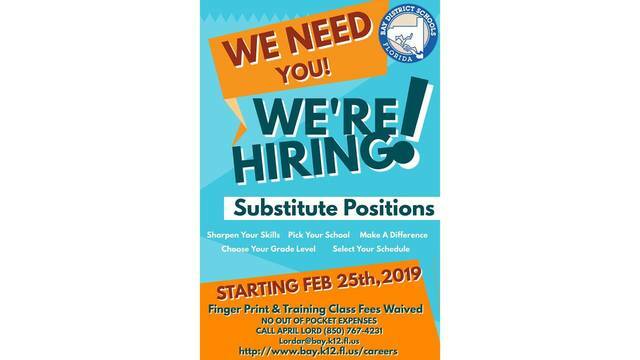 Bay District is in need of more substitute teachers. District officials said they are short about 100 substitutes after the storm. Usually they have more than 300. This shortage is causing stress on teachers who fall ill or need to tend to their homes after the storm. To help applicants, the district will waive finger prints and training fees beginning February 25, for the rest of the school year. Those fees usually cost applicants close to $100. To become a substitute, you must have at least a high school diploma, pass a background check and complete an online training course. The pay is $10-12 depending on degree. Substitutes can choose which days they work and what grades and schools they prefer. "People are still recovering from the hurricane, and often times people who are becoming substitutes aren't employed right now and so being able to start working right away really helps someone other than trying to come up with $100 to get started," said human resources executive director Shirley Baker.